You are here: Home / Home & Family / Easter Recap! This past weekend was jam packed with Easter fun. There was egg dying. There were egg hunts. There was a lot of chocolate. The kids had a blast with all the festivities and it was a great Easter. We started off with some egg dying. 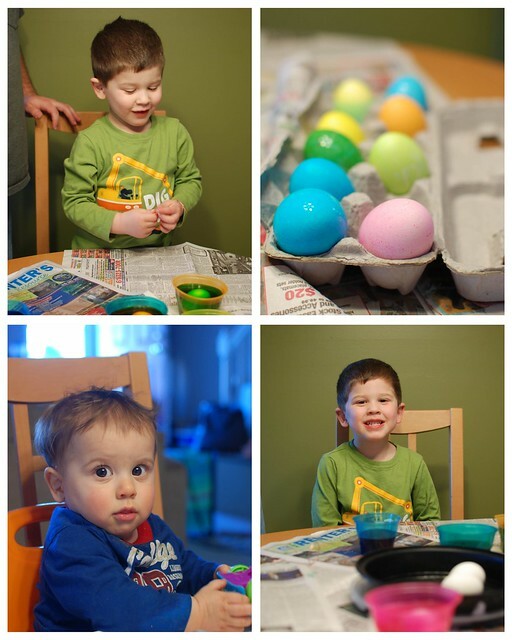 Benny supervised E’s egg dying skills. Then we had a small neighborhood egg hunt for the babies. 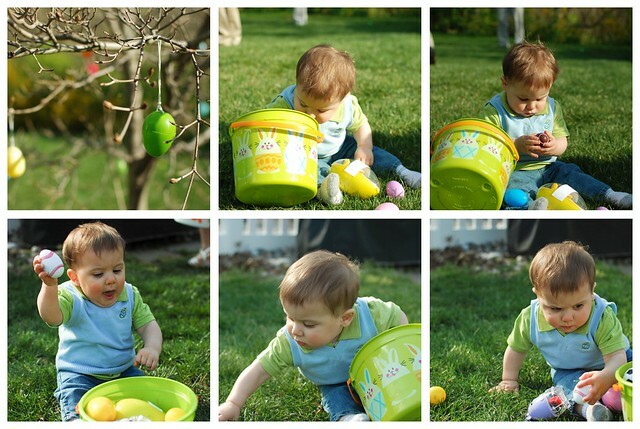 Benny was sharpening his skills for Auntie’s big egg hunt the next day. E got up bright and early Easter morning and declared that the Bunny came and we needed to get out of bed right now. The Bunny hid his eggs in some tricky spots. Who knew E could reach the dining room light? When did he get so big?! Benny somehow slept through the declaration and woke up shortly after E was done searching for eggs. Now it was his turn. 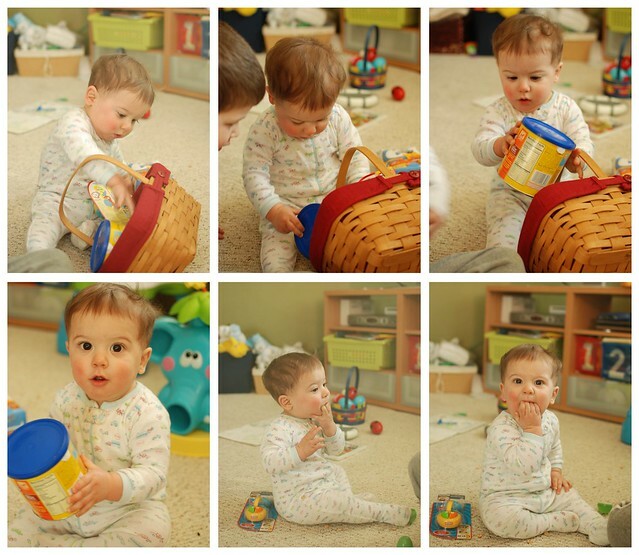 I told you this kid would rather play with non-toys! 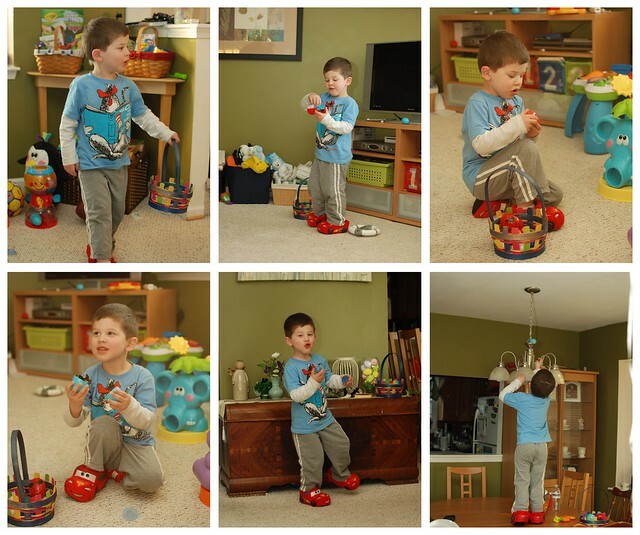 After a relaxing morning of chocolate eggs for breakfast and playing with our new toys, it was time to head to Auntie’s. The main event is not the delicious dinner she made. Nope! It’s the Easter egg hunt. 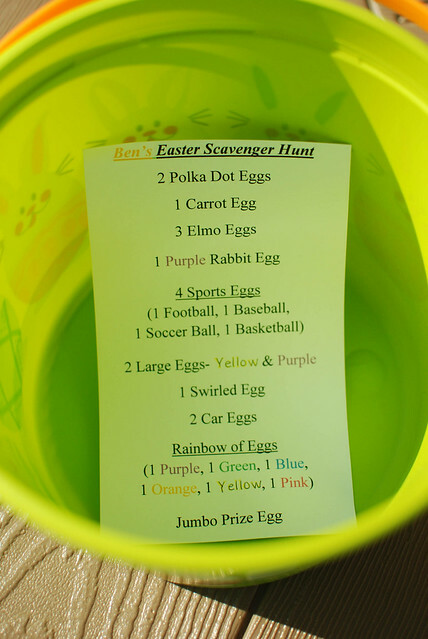 Each kid get’s their own list of eggs to find. E was off finding his eggs while I was in charge of collecting the eggs for Benny. He happily sat in the grass and gave side-eye to anyone who came close to his basket. I attempted to get a nice picture of the boys together but that is an entirely separate post! I hope everyone had a great Easter weekend! Love it! Oh, and C has the same McQueen slippers as E! What a great idea with the list for the hunt. I’ll have to add that to next year’s escapades! Yikes on the light fixture one! The Easter Bunny hid an egg inside a wine glass on our hanging wine rack. I think Mr. Rabbit will be getting one less carrot next Easter for that transgression. How fun! Your boys are just adorable and I love the scavenger hunt you made!